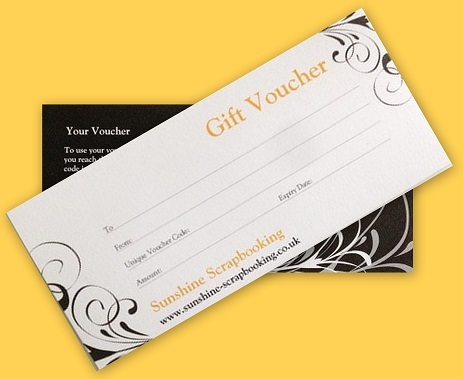 A Sunshine Scrapbooking voucher will make a wonderful gift for a special person who loves Scrapbooking. They are available in £5, £10, £20 or £25 denominations and are valid for 2 years. You can choose the appropriate amount from the drop down menu below. The recipient can then visit our website at their leisure and choose from all the gorgeous scrapbooking paper, stickers and scrapbook albums. We will post your voucher (with plain envelope) free of charge to you for inclusion in a card, or if you would prefer and time is short we can email the voucher code directly. Each voucher has a unique code which can be typed into the voucher box at checkout. Full instructions are provided on the back of each voucher.